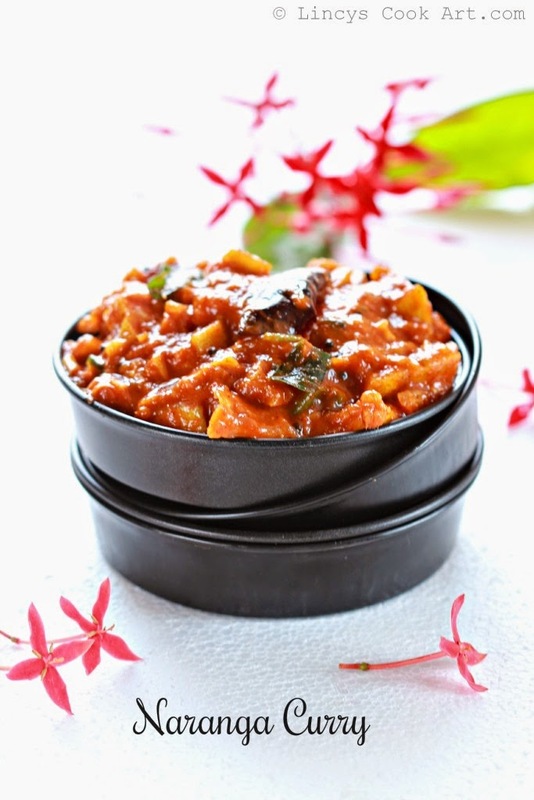 Naranga Curry is also known as Naranga Achar. An instant pickle made out of Indian curry lemon. This can be prepared and served instanly or you can store at room temperature for a week or under refrigerated condition for month. When days go the peel soften and the pickle's taste increases. On an Onam Sadya there are many options for pickles. Mango, Gooseberry, Lemon pickles can be prepared. But this pickle gives an authentic touch to the whole platter. So i always prepare this pickle for Onam sadya. Wash the curry lemon and wipe them to dry. Chop the lemon into small pieces and remove the seeds as much as possible while chopping. Heat oil in a pan and add chopped ginger and green chilli. Cook for a minute and add the chopped curry lemon and salt. Cook till the flesh starts to become soft. Add turmeric and chilli powder. Cook for minute. Soak the tamarind in quarter cup of water and extract the juice. Add the tamarind water in to the curry lemon mixture and allow to boil. Add the powdered jaggery; cook till the raw taste of tamarind leaves and slightly thickens. Add the Asafetida and cook for a minute and switch off the gas. Heat oil in a pan and add mustard seeds once it splutter add the dried red chilli and curry leaves. Add the tempering over the curry lemon pickle. Absolutely finger licking achar ..
Well prepared achar & nice presentation . very tempting Naranga achaar....lovely presentation Lincy! Pics are tempting me to make it soon. Looks mouthwatering dear.. I feel tempted looking at your gorgeous pics..